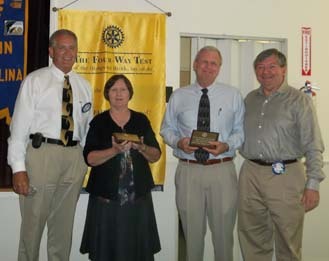 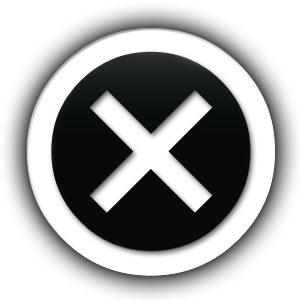 Each year the Rotary Club of Franklin conducts the 4 Way Test Program. 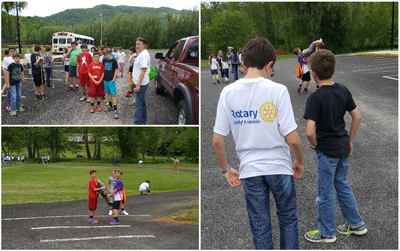 The club teaches young students in the community the 4 way test and how it applies to potential problems they maybe facing in real world situations. If you would like to volunteer and help make a difference in a young person’s life, contact Amy Manshack. 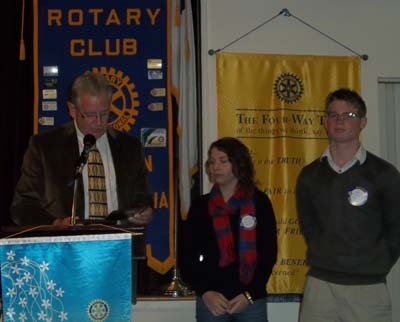 New Rotary Club of Franklin members recognized for their 4 Way Test Efforts on February 19th, 2014…Amy Manshack, Sam Blasingame, Tammy Farrell, Marvin Ramsey and Chris Baldwin. 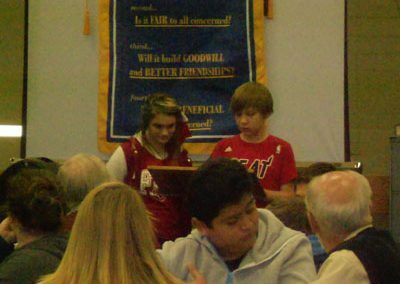 Students at Macon Middle School talking about the 4 Way Test on November 15th, 2013 and how it applies to potential problems they may face in life. 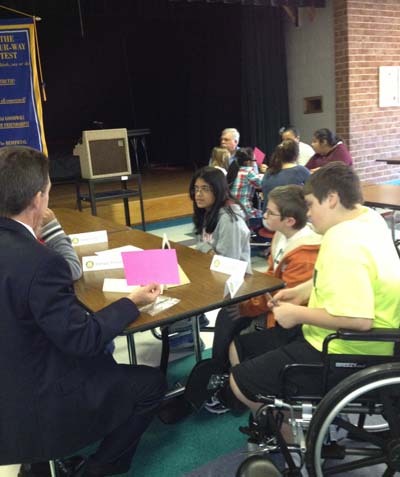 Rotary Club of Franklin’s Keith Keller conducting a 4 Way Test on October 25th, 2013 at Macon Middle School. 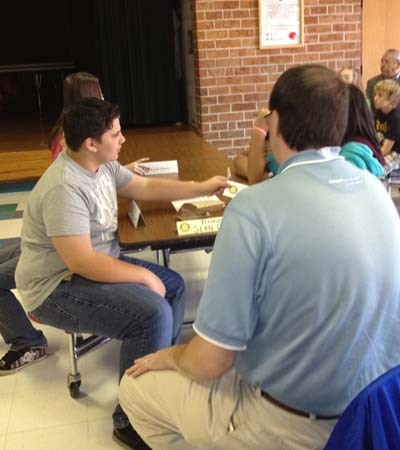 The Four Way Test at Macon Middle School October 16th, 2012. 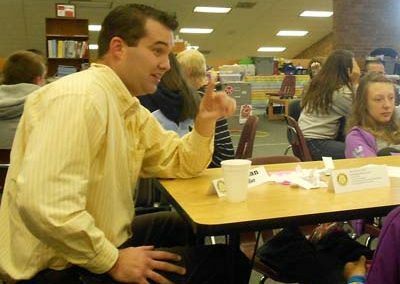 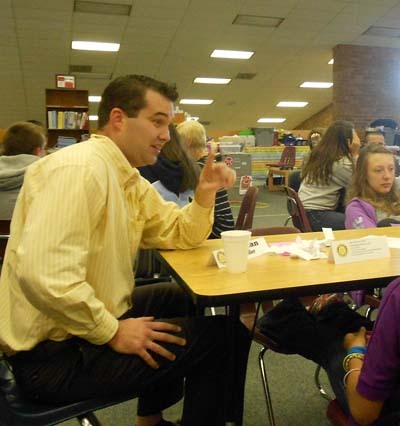 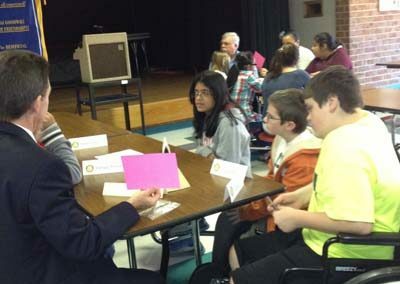 Rotarian Sean Gibson in discussion with 7th graders during the session. 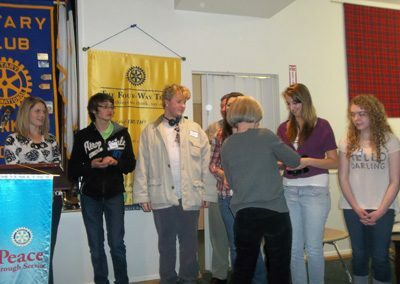 Rotarian Jack Horton’s group is seated to the right. 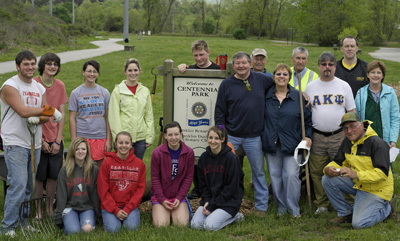 Rotarian Bill Barr and his group. 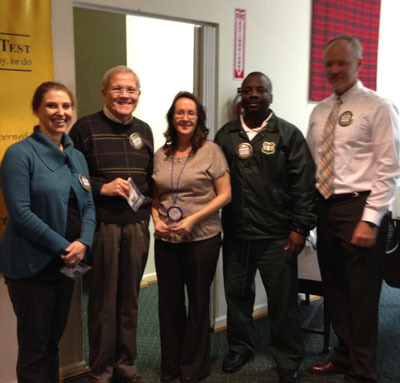 Rotarian Jim Garner’s group is pictured to the right. 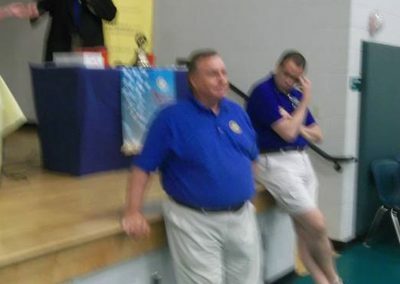 Rotarian Four Way Test Co-conductor Fred Drexler with Rotarian John Henning, Jr. being introduced at Macon Middle School. 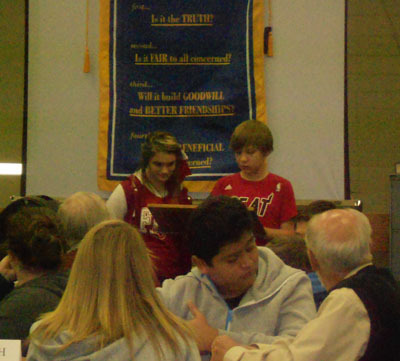 Rotary Youth Leadership Academy helps young people discover their leadership skills and develop new ones. 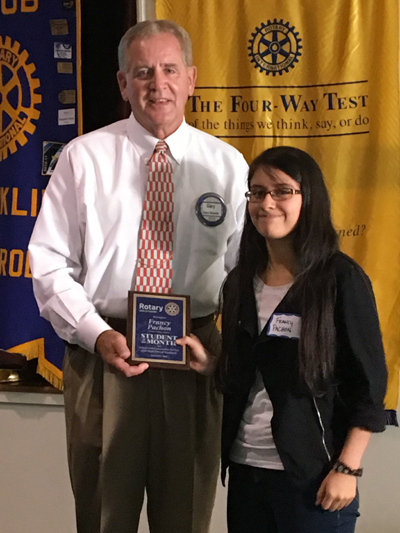 The Rotary Club of Franklin sponsored was proud to sponsor two students in 2016. 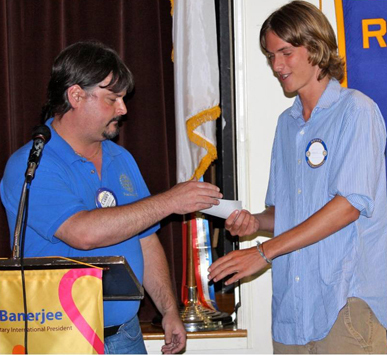 The club also recently sponsored a student in 2011-12 as well as two for 2012-13. 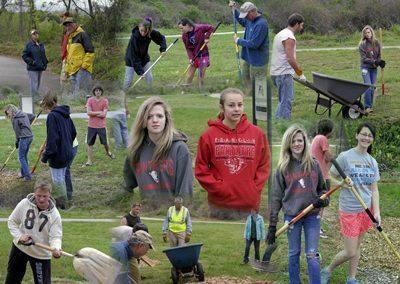 For more information on this project see Youth Services Chairs for 2017-18 Larry Hollifield. 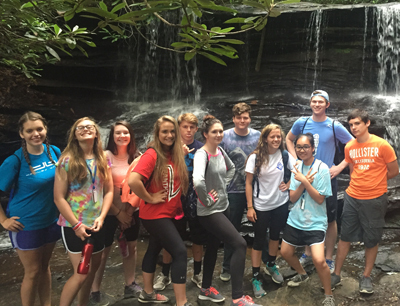 RYLA students at the 2016 camp at Brevard June 19-25, 2016. 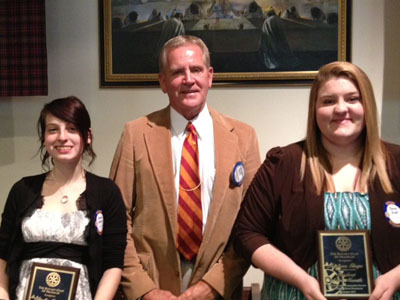 The club sponsored two rising FHS seniors Sidney Gibson and Shelby Frazier. 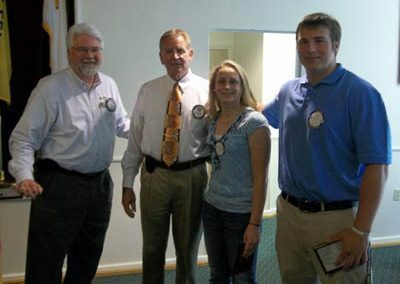 Rotary Club of Franklin president Nancie Wilson (L) pictured with RYLA attendees Jesse Palmer (2013), Lexi Edwards (2012), Madi Coulter (2013). 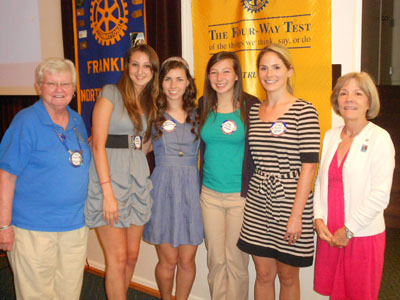 FHS Interact FHS sponsor Tiffany Garrett is 2nd from right and Franklin Rotary President-Elect Susie Ledford is far right. 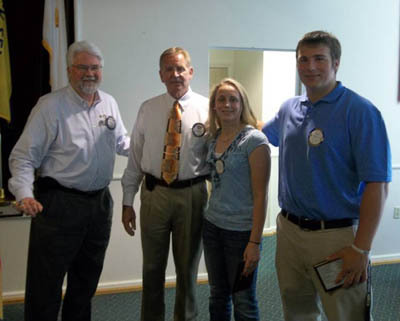 Rodney Webb, Chairman of the District 7670 Rotary Youth Leadership Academy program, spoke to members of the Rotary Club of Franklin on April 11th, 2012. 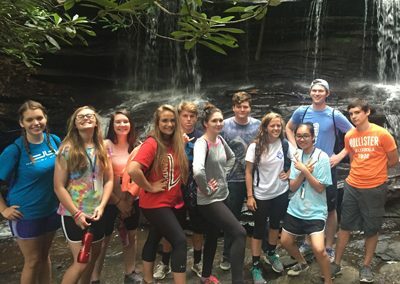 Webb talked about the purpose of the program in selecting promising high school sophomores, juniors and seniors and enhancing leadership skills among the students at the program’s camp. 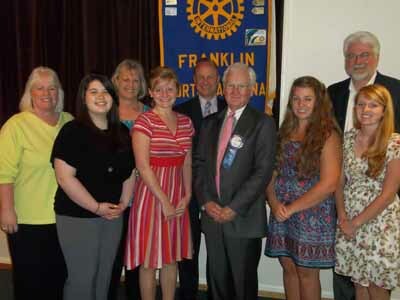 Each year The Rotary Club of Franklin awards five scholarships to five deserving Franklin High School students. 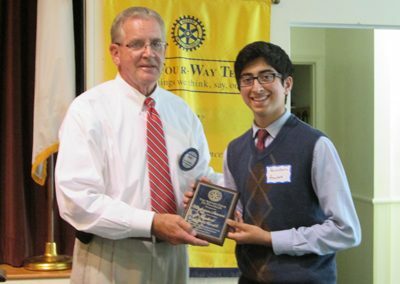 Each year a grand scholarship is awarded in the amount of $12,000 with four additional scholarships in amounts of $500 to $1000 dollars. 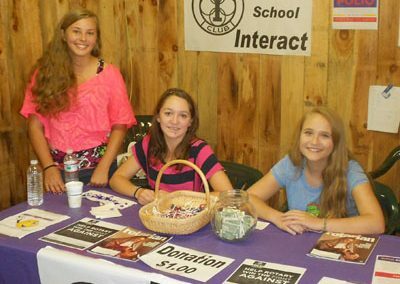 The money to fund these scholarships is generated through the club’s annual fundraiser held each July from the sale of raffle tickets, program ad sales and silent auction sales. 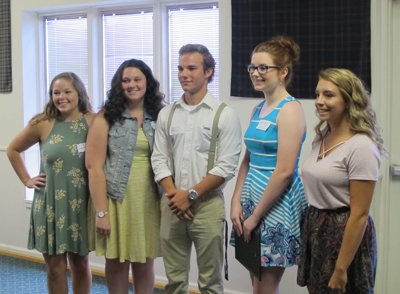 Roy Rickman Scholarship finalists for 2016…FHS’s Olivia Stewman, Madysen Mercer, Jonathan McAllister, recurring winner Peyton Dudra and Mary Katherine Karcher at the July 6th, 2016 club meeting. 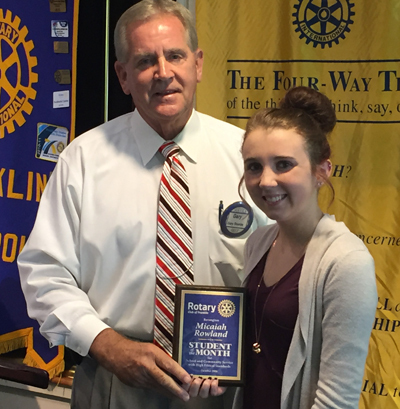 FHS senior Ashley Hull is the 2015 recipient of the Roy Rickman renewable scholarship. 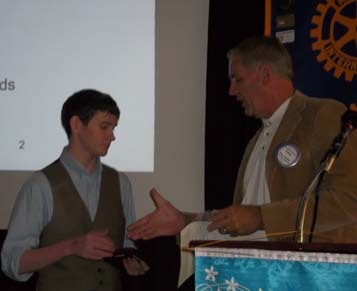 Hull was awarded the scholarship by Club Chair Bud Siler May 27th, 2015 at the club academic banquet. 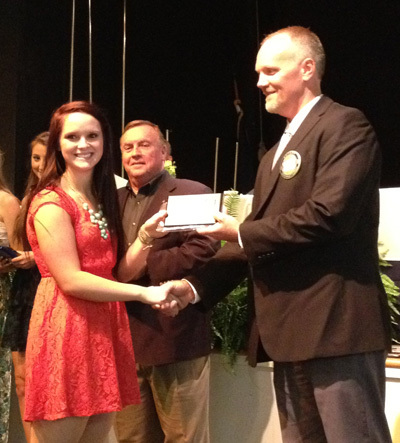 The $1000 scholarship winners were Kacie England, Lexi Kloeppel, Garrett Higdon and Olivia Coulter from FHS. 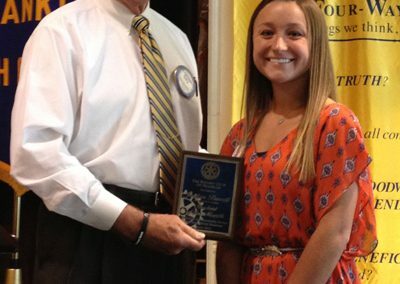 Haley Jordan Williams received the $3000 per year renewable Roy Rickman Scholarship for 2014 on May 20th, 2014 at the Academic Excellence Banquet hosted by the Rotary Club of Franklin. 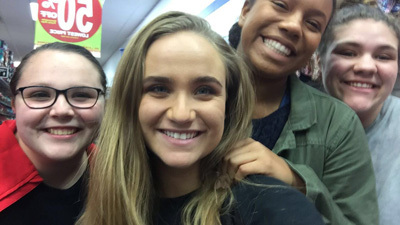 Recipients of the four $1,000 scholarships included Christy Marie Barton, Katrina Marie Harris, Margaret Lynn McAllister and Jessie Lynn Palmer. 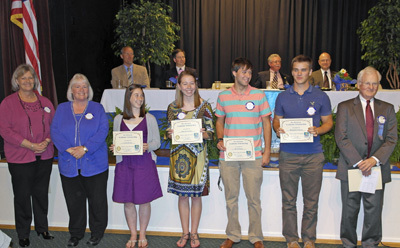 The 20-13 Roy Rickman Scholarship winners at the May 7th, 2013 Rotary Club of Franklin Academic Excellence Banquet at Tartan Hall in Franklin. Winners include FHS Seniors Cassie Doster (3rd from left) receiving $12,000, Rayven Casada (C), Brett Palmer (3rd from right) and Ben Watson (2nd from right). 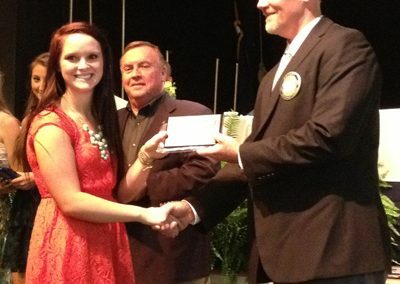 Casada, Palmer, Watson and Carrie Doster (not pictured) each won $1000 scholarships. 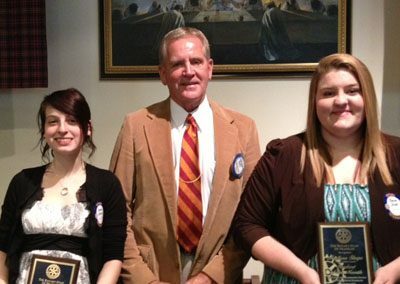 The 2012 Rickman Scholarship winners were awarded at the May 30th, 2012 club meeting by Rotary Club of Franklin Rickman Scholarship Committee Chairman Bud Siler (C) and include Sloane McDowell, the grand scholarship winner of $12000 over 4 years, Andrea Bell, Olivia Boss, Jessie Giaquinto and Breana Steele, all recieving $1000 each. 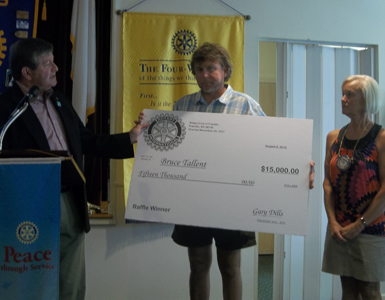 Bruce Tallent (c) winner of the Rotary Club of Franklin’s recent Roy Rickman Scholarship Raffle is presented a check for $15000 by club president Gary Dills (L) and Rotarian Robin Jenkins (R), who sold Tallent the winning ticket. 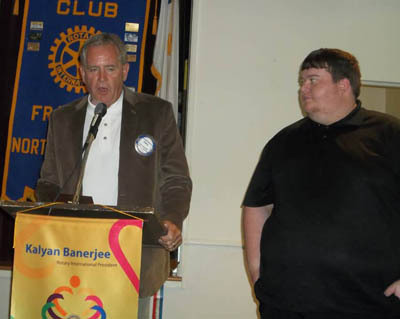 The presentation was made at the August 8th, 2012 meeting. 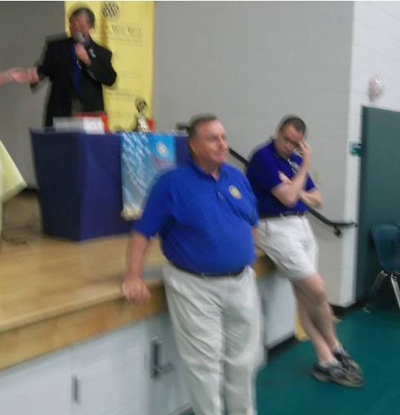 Club President Gary Dills (R) announcing numbers at the Rickman Raffle 2012. 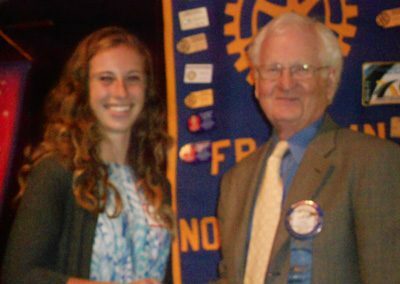 President-Elect Nancie Wilson pictured (L). 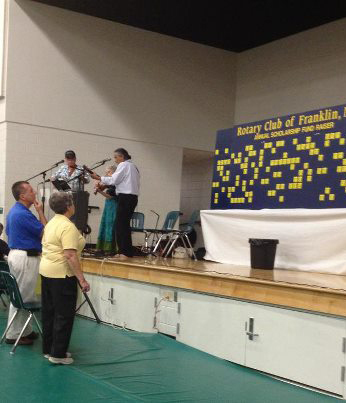 Rotarians John Short and Demi Bray observe action on the raffle board at Rickman 2012. 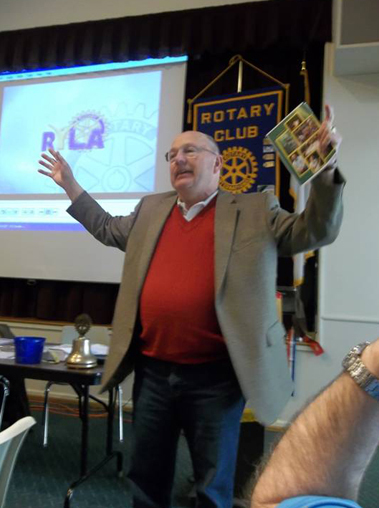 John Yermack (C) looks up auction item info online at Rickman 2012. Member and Past District Governor Dennis Sanders (L) finishes 2nd in the Rickman Raffle. 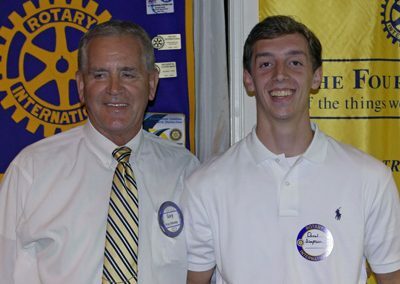 Public Relations Director Sean Gibson (R) takes 4th place. 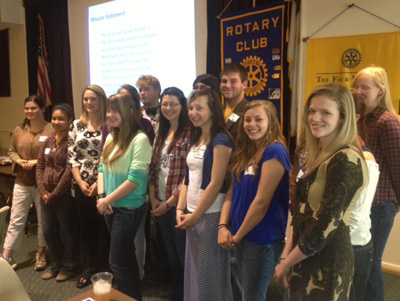 Interact is the Rotary Club within the high schools and middle schools. 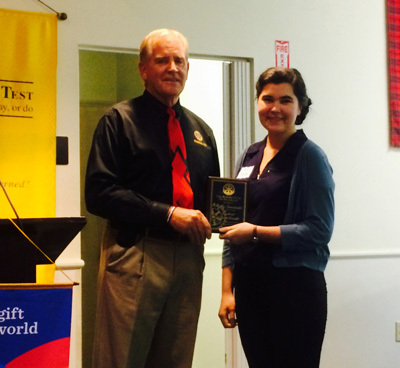 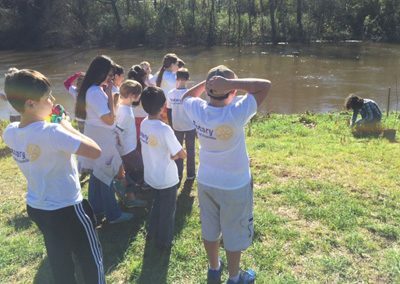 The Interact Club fosters knowledge of the world and how Rotary and its members are doing good, one person at a time. If you would like to get involved with this project see Interact Chair and Youth Service Chair Larry Hollifield. 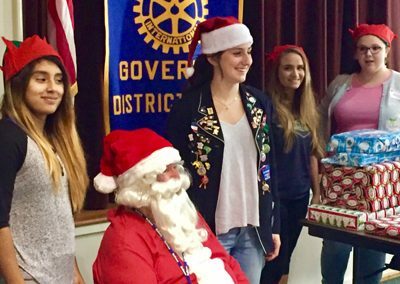 Members of the FHS Interact Club shop for an adopt a family on Wednesday December 14, 2016. 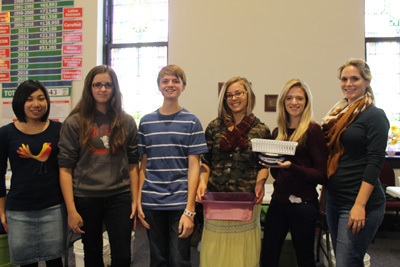 The Interact Club raised $225 with a club match for a total of $450 to shop for the family. Members of the Interact Club helping Santa deliver gifts at the December 7, 2016 meeting. Members of FHS Interact, Rotakids, Boy Scout Troop 202 and the Rotary Club of Franklin at the Green Way Cleanup April 23, 2016. 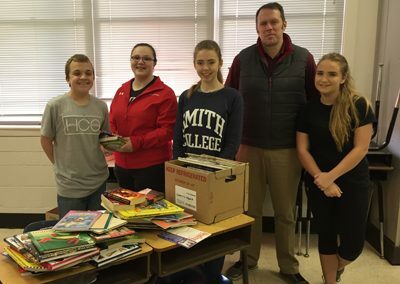 The Interact Club collected 400 books in the annual book drive for Read2Me in February 2016. 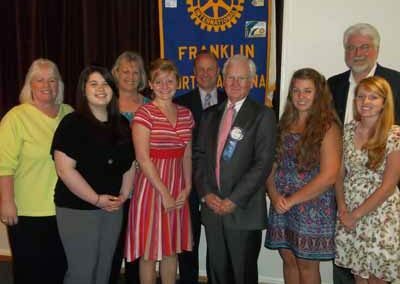 Rotary Club of Franklin 2015-16 President Sean Gibson pictured with some of the members. 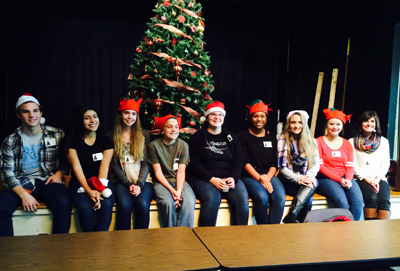 Members of the FHS Interact Club at the Children’s Christmas Party December 2015. 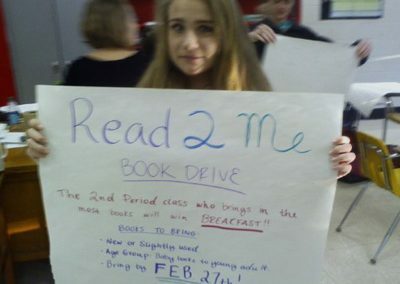 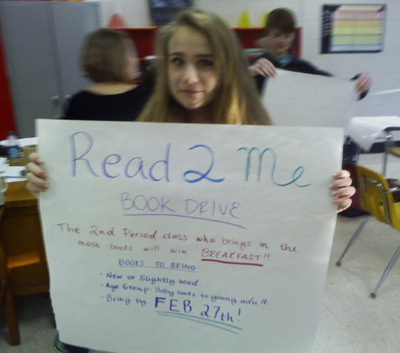 Interact members make posters to promote the Read2Me book drive for 2015. 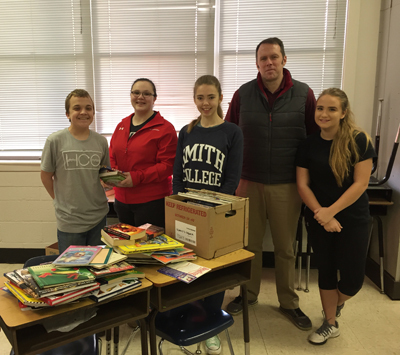 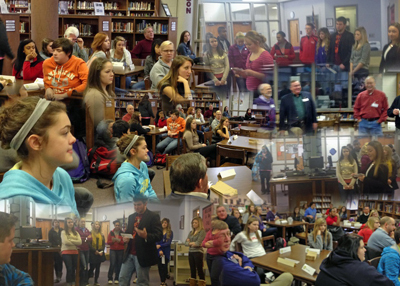 Youth Services Director Larry Hollifield and members of the FHS Interact Club delivered 500 books to Read2Me on January 15th, 2014. 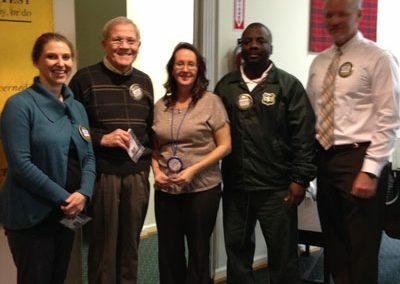 Great work Rotary! 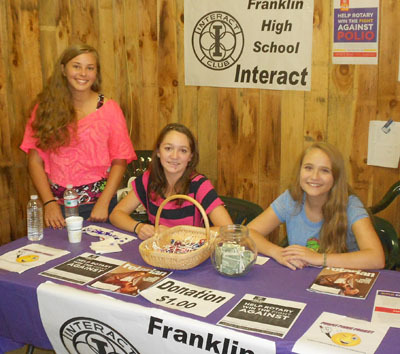 Members of the FHS Interact Club at the Macon County Fair September 14th, 2013 raising money for Polio Plus. 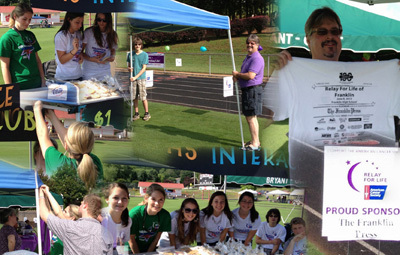 FHS Interact and the Rotary Club of Franklin at the Saturday June 8th, 2013 Relay for Life. 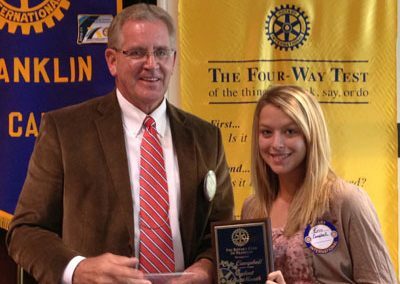 Rotary Club of Franklin President Gary Dills presented a Family and Community Service award May 15th, 2013 to Mrs Tiffany Garrett for her hard work and dedication on behalf of FHS Interact and Rotary. 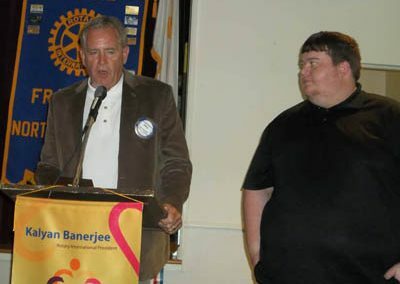 Youth Service Director and Club Interact Chair Larry Hollifield, P-N Susie Ledford, International Director Sandy Frazier, Rotarian Chris Baldwin and Daybreak Rotarian Terry Stamey were there to honor Mrs Garrett as well. 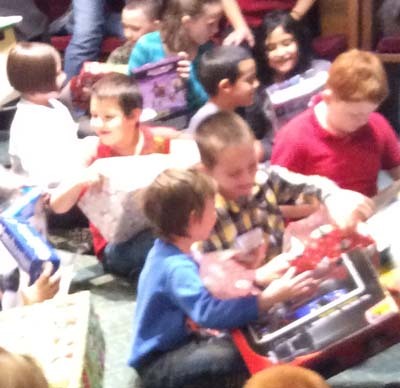 Thank you Mrs Garrett, well done! 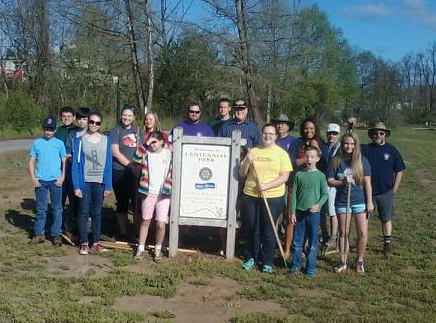 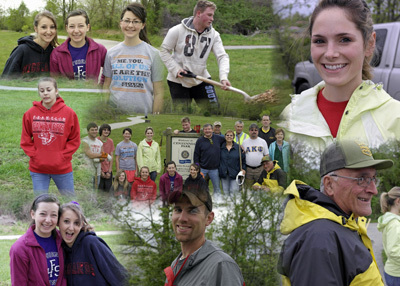 Members of the Rotary Club of Franklin, Franklin Daybreak Rotary and the Franklin High School Interact Club cleaned up a section of the Little Tennessee River Greenway on Saturday May 4th, 2013. 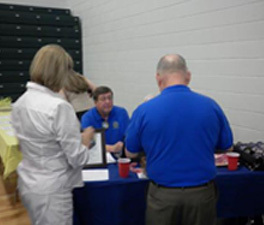 Those participating included Rotarians Gary Dills, Sean Gibson, Larry Hollifield, Tom James, Larry and Terri Stenger, Ron Winecoff, Ed Prather and Terry Stamey. Interact members included Sarah Collins, Olivia Coulter, Jessie Palmer, Rachelle Baldwin, Madi Coulter, Tyler Hollifield, KJ Neitz and Chris Witt. 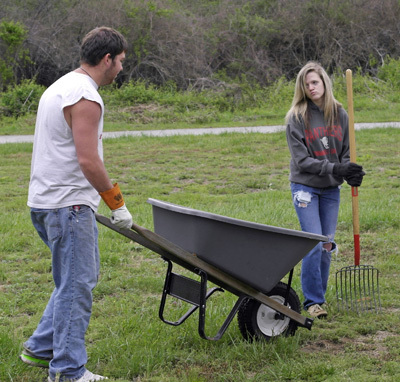 The interact teacher adviser Tiffany Garrett along with her husband Arron Garrett also participated. 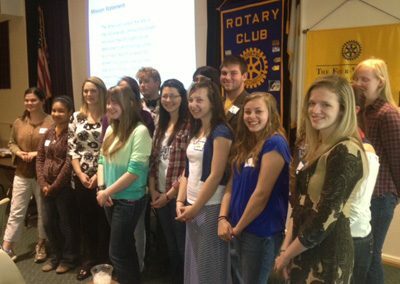 FHS Interact Club members at the April 3rd, 2013 Rotary Club of Franklin Meeting. 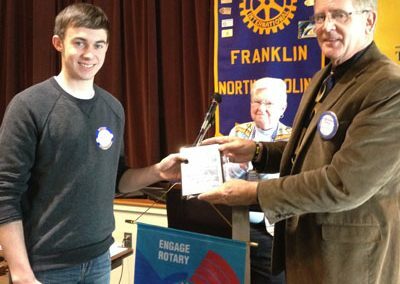 Rotary Club of Franklin member Larry Hollifield (L) presents FHS student and Interact Member Canyon Woodard a check for $500 at the August 3rd, 2011 Meeting. 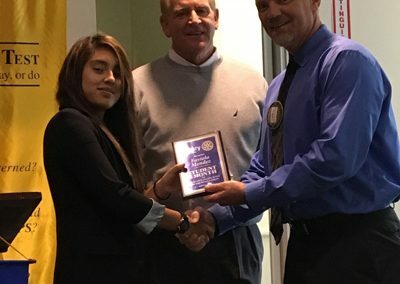 The Rotary Club of Franklin recognizes the efforts and achievements of high school students, college level students, teachers and administrators. 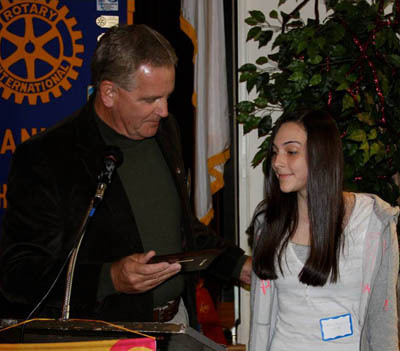 Students are recognized for their service to their community as well as outstanding individual character. 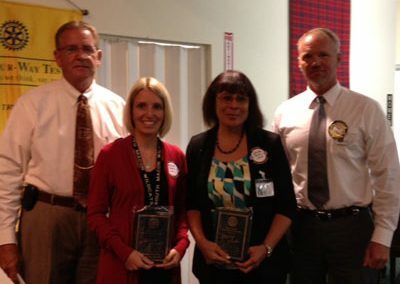 Teachers and administrators are recognized for their oommunity service as well as the development of leadership and character in students. 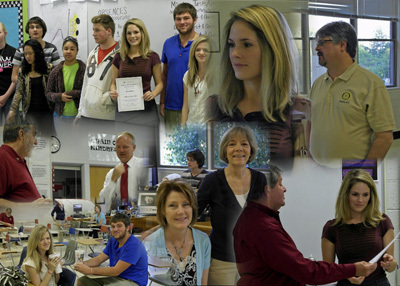 The students, administrators and teachers are recognized during the last regular meeting of each month during the academic year. 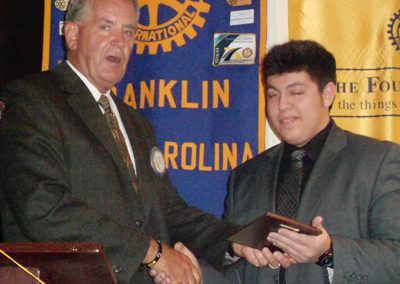 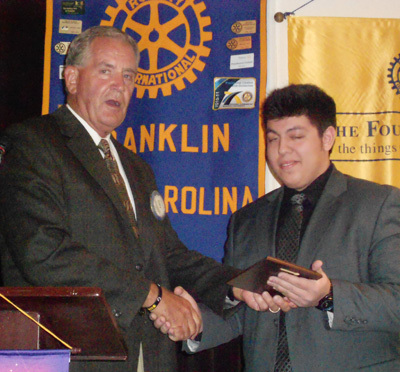 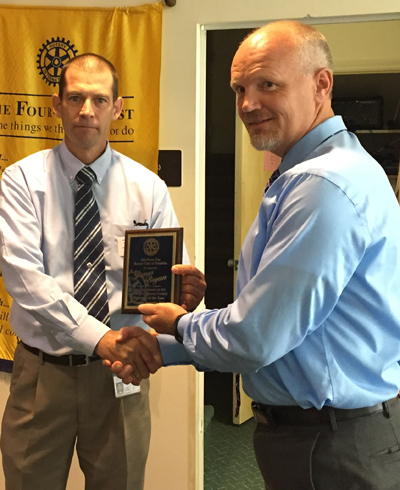 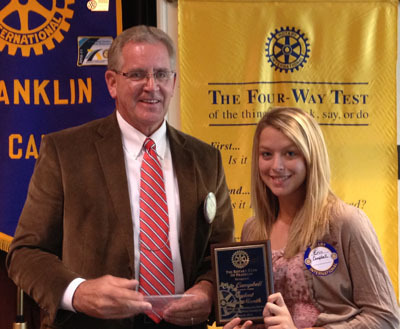 For more information on the Rotary Club of Franklin Student of the Month program, contact club champion Gary Shields. 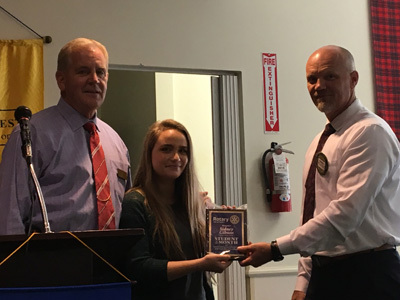 Sidney Gibson, FHS Senior, was recognized as March Student of the Month on March 22, 2017. 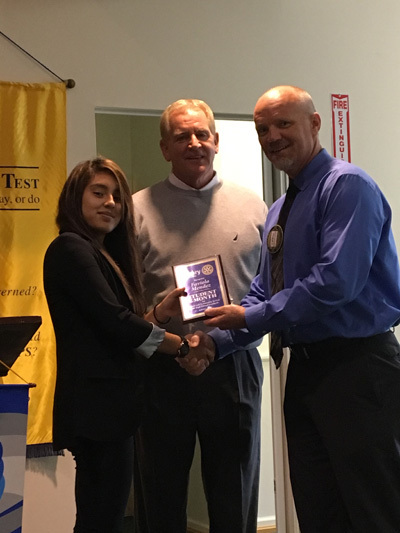 Faviola Mendez a senior at FHS was recognized as February Student of the month on February 22, 2017. 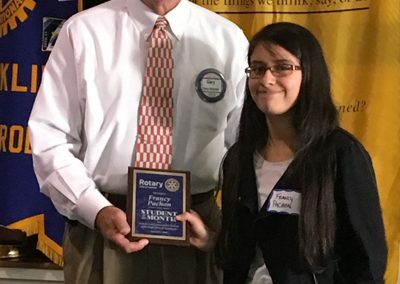 Francy Pachon was November 2016 Student of the Month. 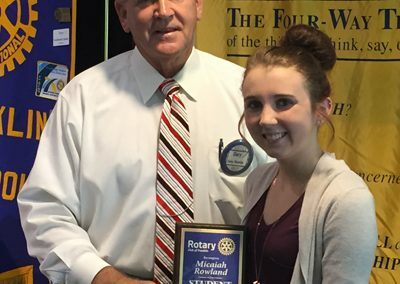 Micaiah Rowland was recognized as October 2016 student of the month. 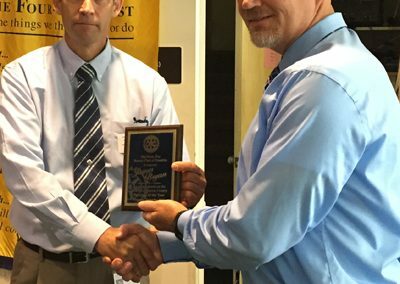 James Bryan of Nantahala School was recognized as Macon County Principal of the year at the September 28, 2016 club meeting. 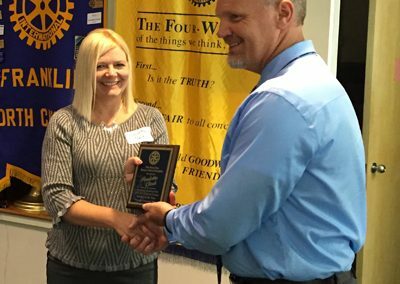 Pauletta Clark of Iotla Valley School was reognized as Macon County Teacher of the Year September 28, 2016. 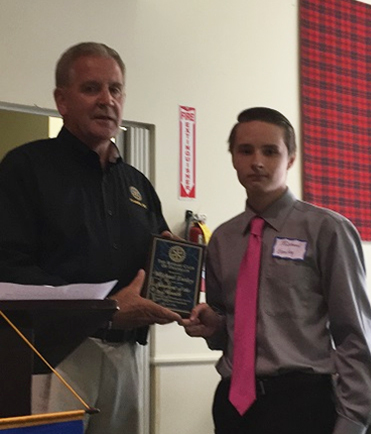 FHS Junior Michael Ensley is April 2016 Rotary student of the month. 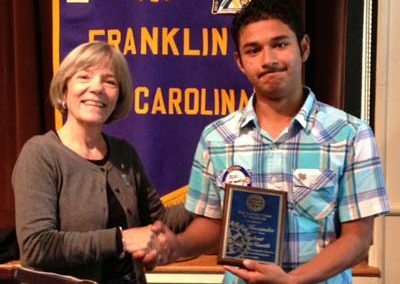 FHS Senior Jordan Bryson was recognized as March Student of the Month April 27, 2016. 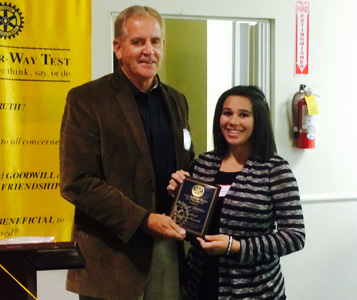 Alyssa Childers was named November 2015 student of the month. 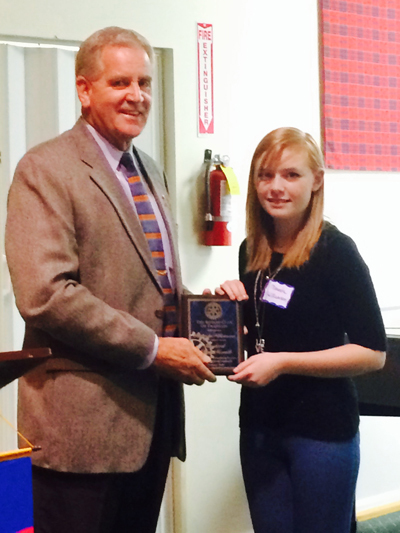 Molly Suminski is recognized as October student of the month on October 28th, 2015. MEC’s Purshotam Aruwani is recognized as Student of the Month September 2015. 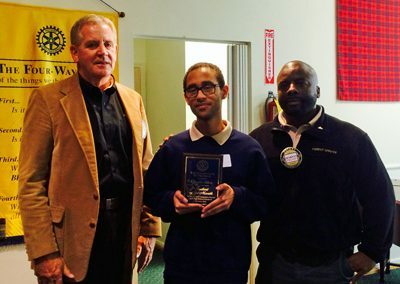 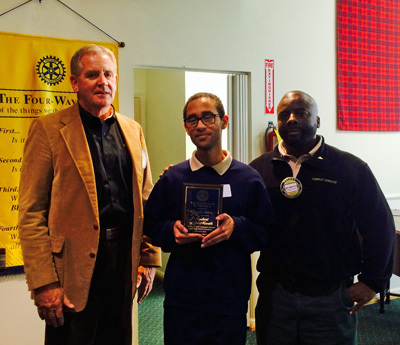 MEC Student Chris Chastain was recognized as November Rotary Student of the Month on November 12th, 2014. 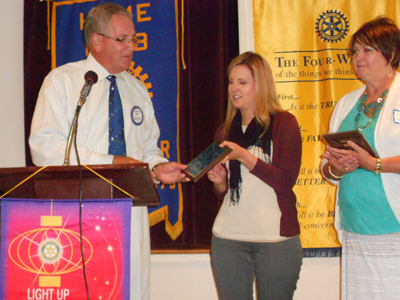 Rotarian Gary Shields presents Laura Wooten (R) with the Macon County Educator of the Year award and Delaney Hollaway with Teach of the Year at the September 24th, 2014 Rotary Club of Franklin meeting. 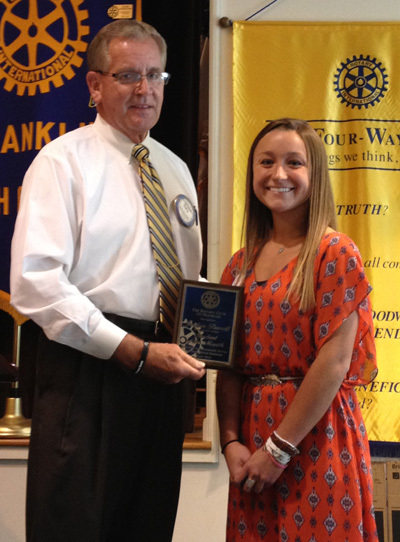 FHS Senior Jordan Burrell is April 2014 Rotary Student of the Month. 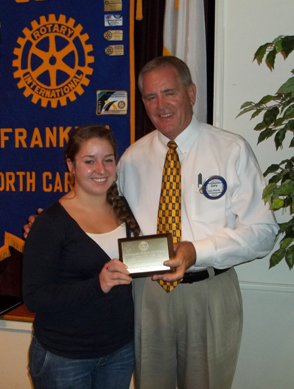 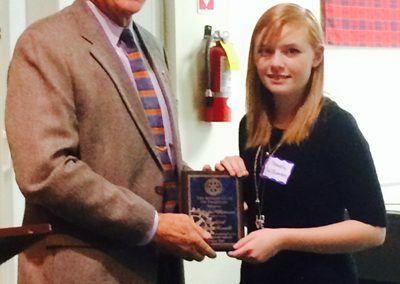 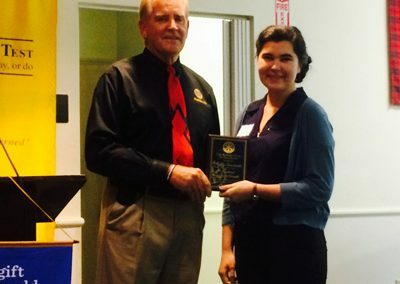 Rotarian Gary Shields presents FHS senior Erin Campbell the March Student of the Month on April 2nd, 2014. 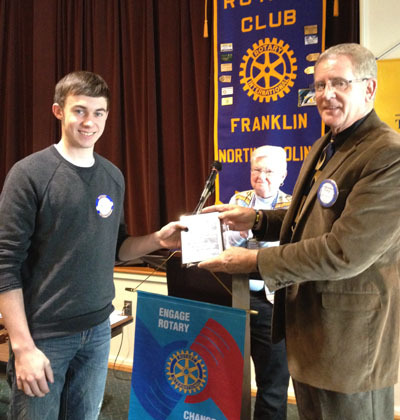 Andrew Baldwin, a senior at FHS is recognized at the February Student of the Month by Rotarian Gary Shields (R) on February 26th, 2014. The Rotary Club of Franklin presented the November student of the month award to Amelia Owens (L) of Macon Early College and December student of the month (R) to Madison Shope. 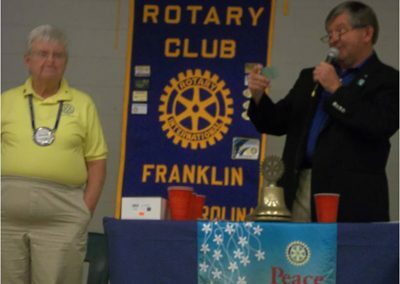 Rotary Club of Franklin’s Gary Shields made the presentation on November 20th, 2013. 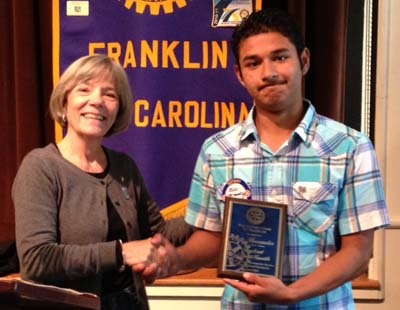 Club PE Susie Ledford presents Macon Early College student Oscar Hernandez with the October Rotary Student of the Month. 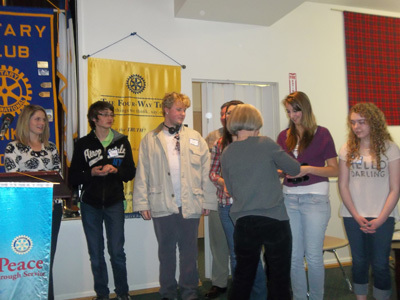 The presentation was made at the October 23rd, 2013 meeting. 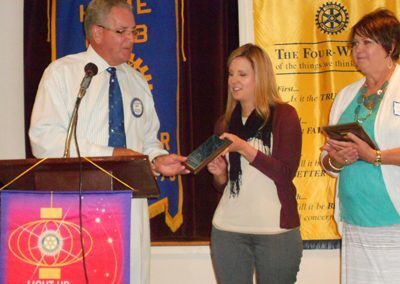 Macon County School Board Member and Rotarian Gary Shields presented Rotary Club of Franklin awards to Macon County Teacher of the Year Melissa Faetz of South Macon (2nd from left) and Principal of the Year Shirley Parks from East Franklin Elementary School on September 25th, 2013. Pictured far right is school superintendent Dr. Chris Baldwin. 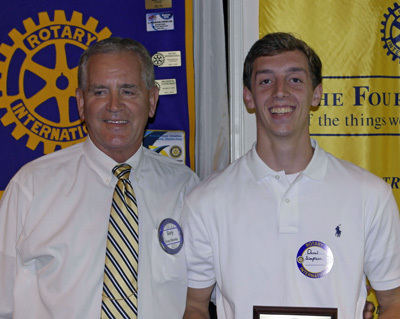 Rotary Club of Franklin’s Gary Shields presents Franklin High School Senior Drew Simpson with Rotary Club of Franklin Academic Student of the Month for May 2013 at the May 1st regular meeting. 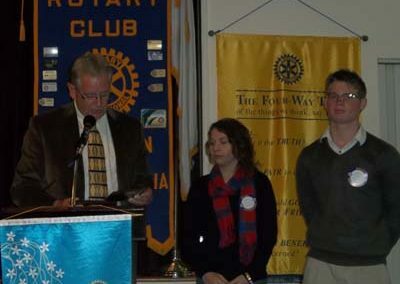 Rotary Club of Franklin New Generations Co-Director and Macon County School Board member Gary Shields (L) presents Franklin High School Students Amber Sellino (C) and Cole McCauley the recognition of Rotary Students of the Month for January, 2013. 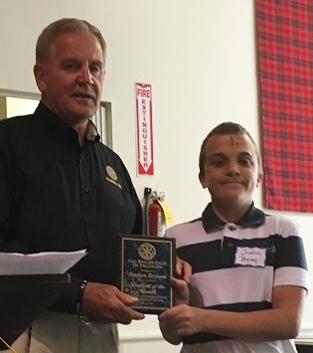 Rotary Club of Franklin New Generations Co-Director and Macon County School Board Member Gary Shields (R) awards Noah Miller (L) with The Rotary Club of Franklin Student of the Month for October. 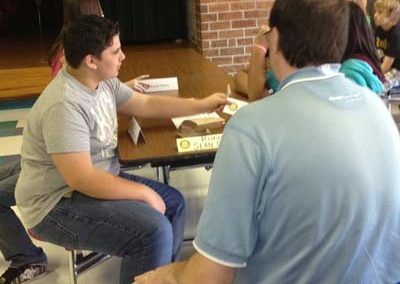 Miller is a second year student at Macon Early College volunteering in numerous activities and is involved in several clubs. 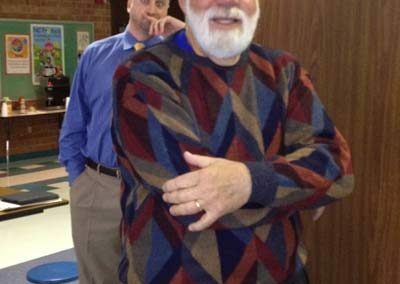 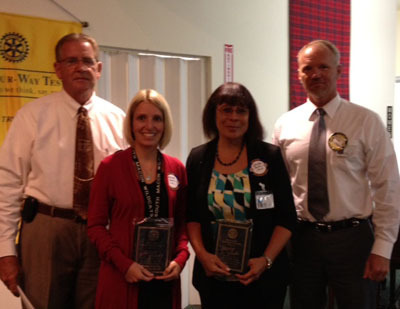 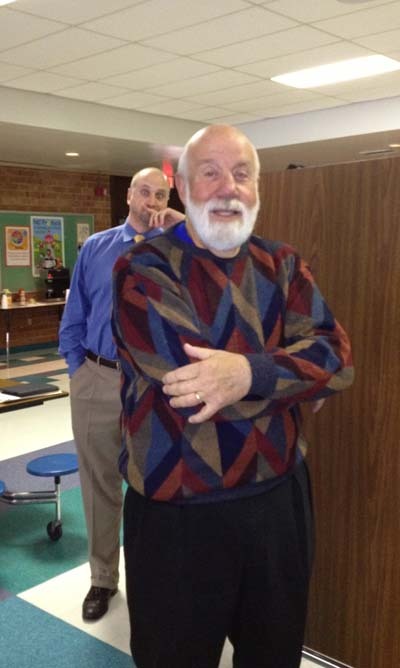 Miller was recognized at the October 31st, 2012 club meeting. 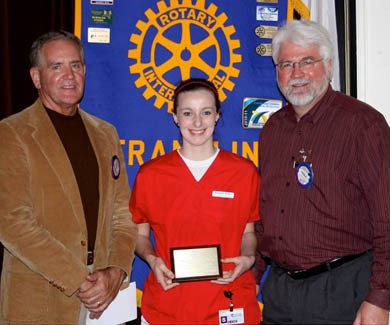 Emma Ritter was named Rotary Student of the Month for November, 2012. 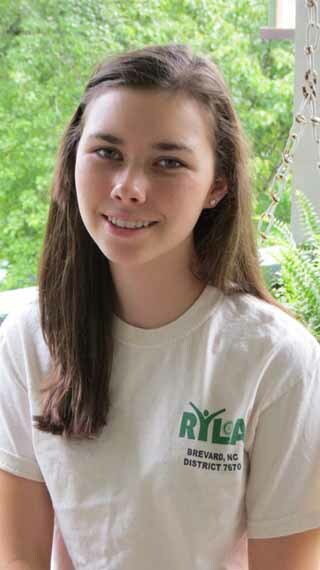 Ritter is a junior at Macon Early College. 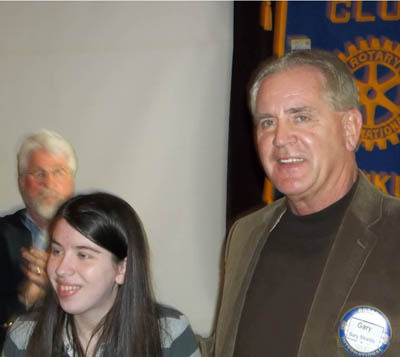 Macon County School Board and Rotary Club of Franklin member Gary Shields (L) recognizes Macon County Teacher of the Year Rita Esterwood from Franklin High School (2nd from left) and Principal of the Year Tolly Bowles (2nd from right) from South Macon Elementary School at the September 26th, 2012 meeting of the Rotary Club of Franklin. 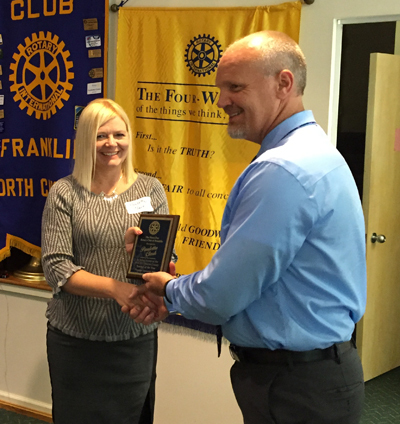 Also honored was support person of the year Karon Anderson from East Franklin Elementary. 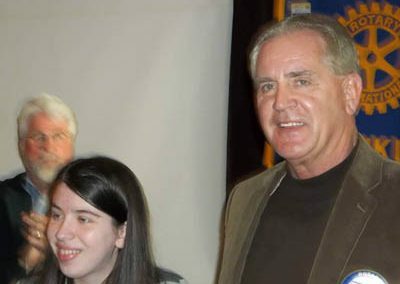 Pictured at right is Club President Gary Dills. 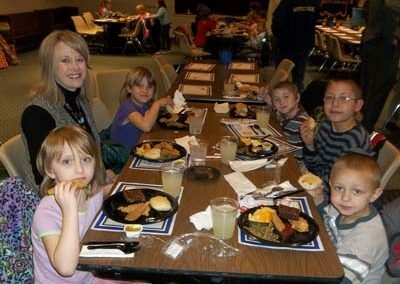 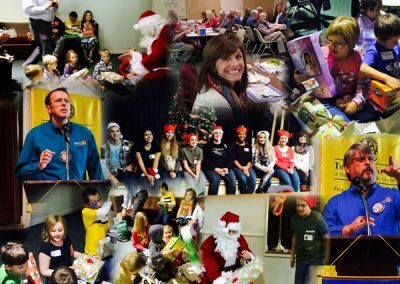 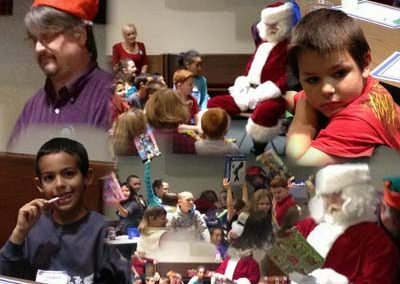 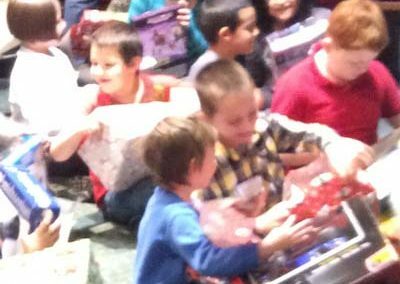 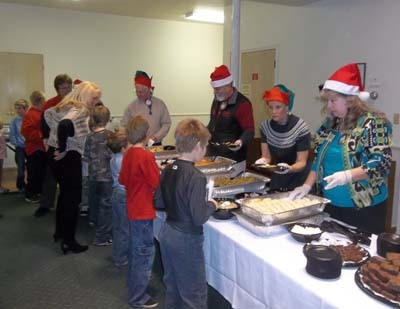 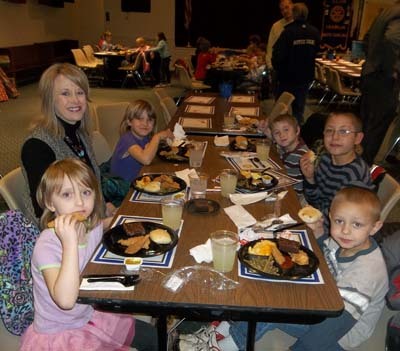 Each year in conjunction with Rotary Family Month in December, The Rotary Club of Franklin hosts a Christmas Party for 25 area children grades 1 to 4. 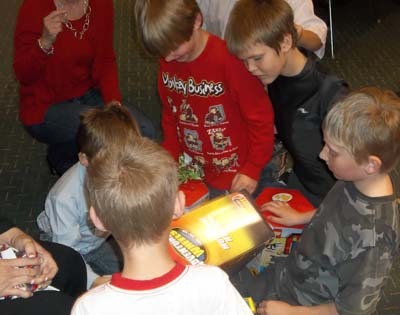 Members contribute funds to aid in the purchase of gifts for those children less fortunate in the community. 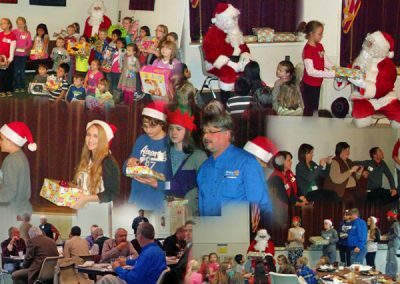 The gifts are purchased prior to the event with the assistance of Rotary Club of Franklin member and Walmart Store Manager James Foxx. 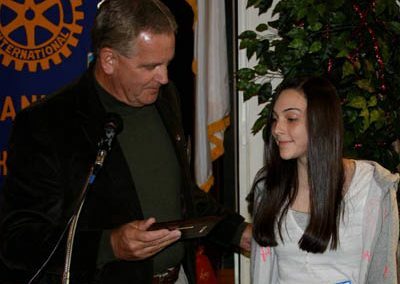 For more information on the event, please contact Youth Services Director for 2017-18 Youth chair Larry Hollifield or champions Patsy Parker and Robin Jenkins. 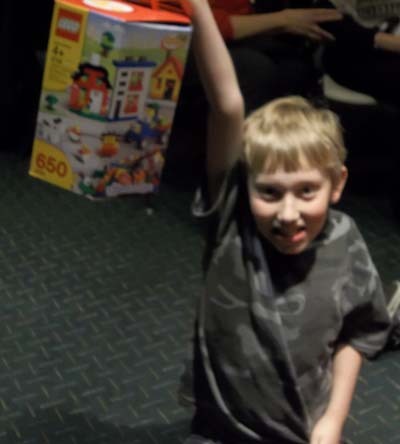 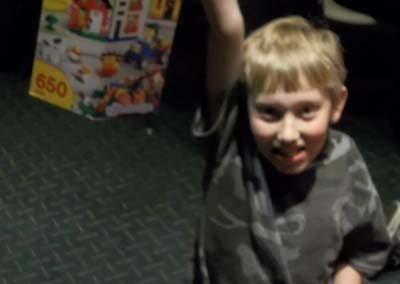 Children open gifts with delight at the 2013 Rotary Club of Franklin Christmas Party December 11th, 2013. 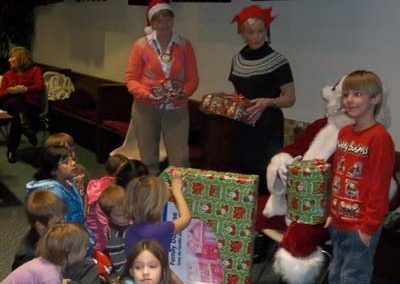 Santa and his Rotarian elves, Debbie Tallent (L) and Robin Jenkins (R) handed out gifts to the children on Wednesday December 12th, 2012. Rotarians (L to R) Bud Siler, Sandy Frazier, Robin Jenkins and Judy Chapman serve lunch to kids during the December 12th, 2012 party. 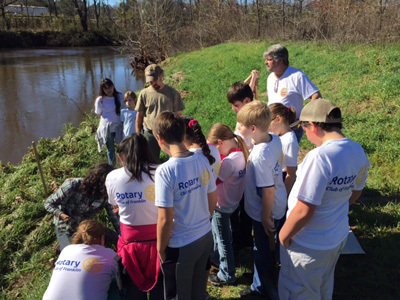 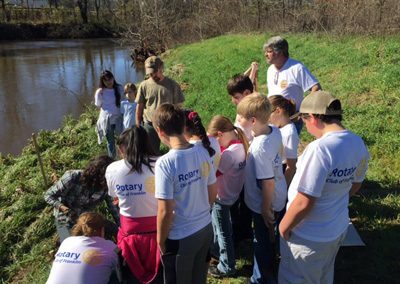 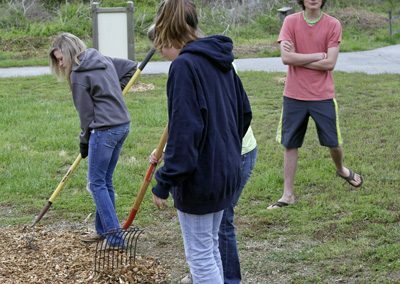 In November of 2015 the Rotary Club of Franklin officially got the Rota Kids club together and hit the ground running with their first service project that included planting trees at the new Parker Meadows Sports Complex in Macon County. 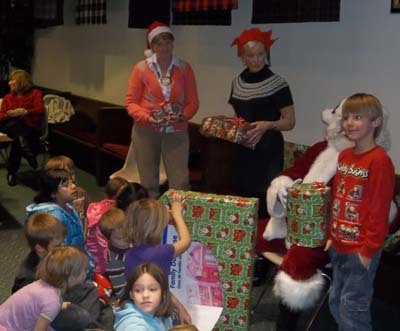 This is the first Rota Kids Club in the district. 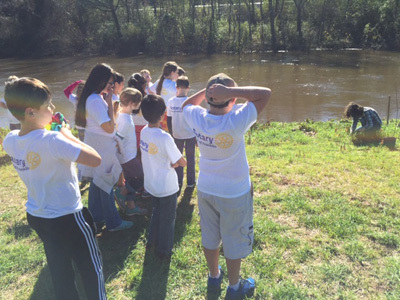 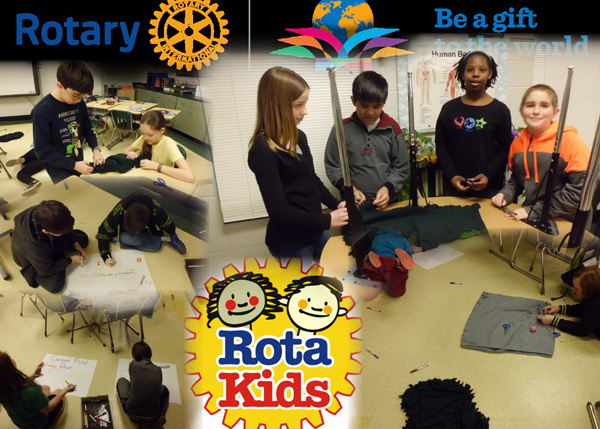 The Rota Kids Club is a group of young Rotarians at Mountain View Intermediate School (grades 5-6). 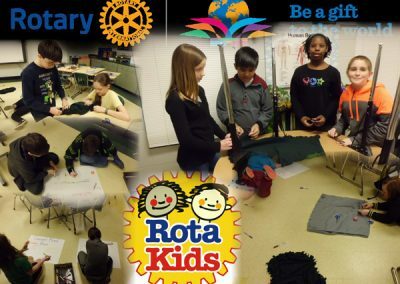 If you are interested in helping with the Rota Kids Club and would like more information, see Youth Service Chair Larry Hollifield. 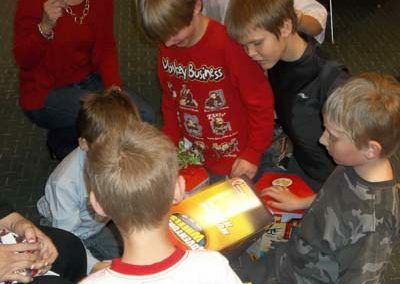 Rotakids at work on their food drive project and making pet beds January 2016. 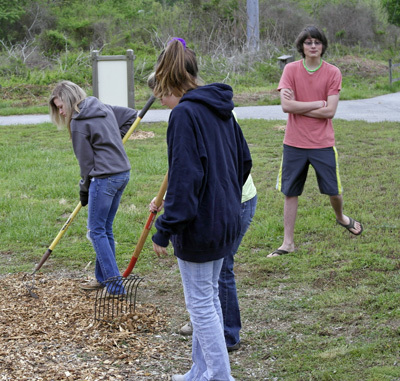 Below, planting trees in fall 2015.